A cluster of 48 traditional picturesque villages (Epirus), built amphitheatrically in the wider area of Timfi, Pindos and Mitiskeli (Zagori region). Zagori's natural environment is exquisite and perfect for many outdoor activities. The local architecture is defined by stone, wood and slate rock. The name “Zagori” is Slavic and means “beyond the mountains”. Ano Pedina. A well-preserved traditional village, built near a plateau (altitude 960 m). Home to a number of eminent thinkers and national benefactors. The Monastery of Evagelistria(1793), contains icons from the 17th-19th century. It is located 35.5 km NW of Ioannina. Vitsa. A traditional Epirus village which consists of Ano (Upper) and Kato (Lower) Vitsa. As the birthplace of important historical figures, the village has many wonderful mansions. Skala of Vitsa leads to the double-arch bridge of Misios, while archaeological digs on route to Monodendri have unearthed a settlement and two graveyards. It is located 36 km NW of Ioannina. Kato Pedina. Known for its stone threshers and ostrich farm. Kato Pedina is built atop a plateau (altitude 940 m) where ancient graves have been discovered. The chapel of Aghios Nikolaos Vastanion-Kalivion dates back to the 15th century. It is located 37.5 km NW of Ioannina. Monodendri. A designated traditional settlement (altitude 1,060 m), with stone houses and picturesque cobble roads, where the Rizario Centre of Handicrafts, with traditional broidery weavings operates. It is located at the entrance of the Vikos gorge. The cobblestone trail leading to the Monastery of Aghia Paraskevi (15th century) and continuing through the gorge is wonderful. It is located 39 km NW of Ioannina. Elafotopos. Elafotopos stands out from the rest of Zagorochoria for its wonderful traditional architecture, its elaborate town planning and the impressive location it is built in (altitude 1,100 m). The churches of Aghios Georgios and Kimisi tis Theotokou contain gold-plated rood screens and old icons. The location “Kastro” contains traces of the fortified settlement of the Molossians. It is located 40.5 km NW of Ioannina. Aristi. A gorgeous traditional Epirus village, where findings from the Paleolithic period have been discovered. The “Stamatis Mansion” is an exceptional sample of the local architecture. The Monastery of Panagia Spileotisas (16th century), built in a beautiful location near the banks of the Voidomatis river. “Kastraki”, with its panoramic view, contains ancient findings. The route at “Kagelia” from the Voidomatis bridge towards Papigo, is charming. It is located 48 km NW of Ioannina. Vikos. This traditional Zahori village is built on the edge of the Vikos gorge (altitude 770 m) where the national part of Vikos-Aoos begins. After 30 minutes of hiking along the trail, you arrive at the springs of the Voidomatis river, an ideal place for excursions and mountain sports. It is located 53 km NW of Ioannina. Papigo – Mikro Papigo. Designated traditional villages of Zagori, with a developed tourism infrastructure and woodcraft workshop. They are two of the most popular villages of the Zagori region and are located within the national park of Vikos-Aoos (altitude 960 m). The two villages which are the starting point for excursions in wonderful natural scenery are connected by a trail. The trail passes by "Ovires" or "Rogova", two small, natural lakes suitable for swimming in the summer. They also offer a view to Astraka, the peak of mount Timfi, while the underground cave “Provatina” in the area is the second deepest in the world. The elementary school in Papigo houses the well-organized Zagori Nature and Culture Information Centre. They are located 59 and 61.5 km NW of Ioannina respectively. Asprageli. Base of the Municipality of Central Zagori, Asprageli was one of the most prosperous villages of Zagori during the 19th century (altitude 1.000 m). Shooting competitions are organized at the nearby plateau and a paragliding field operates at "Kanavistria", the highest point of the village. The Monastery of Panagia dates back to the 16th century. It is located 29 km NW of Ioannina. Dilofo. It is named Dilofo (meaning Two Hills in Greek) because it is built amphitheatrically on the foot of two hills (altitude 880 m). The grand mansion “Arhontiko Makropoulou” at the entrance of the traditional village is imposing. This is the starting point for trails leading to the picturesque chapels of the village, to the Vikos gorge and to Vitsa. It is located 34 km NW of Ioannina. Kipi. A traditional village which is extremely popular with fans of alternative tourism and mountain sports. It is built in the centre of Zagori (altitude 800 m). The rivers Vikakis and Bagiotikos have wonderful single and triple arch stone bridges. It is located 37.5 km NW of Ioannina. Koukouli. A traditional village with large mansions and fountains of exceptional popular architecture, birthplace of national benefactors and intellectuals, such as folklore scientist and herb collector Kostas Lazaridis (1904-1987), whose large herb collection is on display at the Rizario Museum of the Ecclesiastic School “Kostas Lazaridis”. It is located 38 km NW of Ioannina. Dikorifo (Dikorfo). A classic example of an Epirus village, Dikorfo (meaning Two Peaks in Greek) received its name because of its location between two lush peaks of Mitsikeli (altitude 1.000 m). The village Kaloutas with its old churches, triple arch bridge and the Despotis Spring which is located nearby. The Monastery of Vivikou, 4.5 km N of Kaloutas, was established in 1114 and hosts the large fest of August 15th. It is located 38 km NW of Ioannina. Kapesovo. A beautiful village and birthplace of many important hagiographers of the 18th century and other prominent figures such as Alexios Noutsos (1769-1822) who participated in the Filiki Eteria during the Revolution of 1821. Remains of Pelasgian walls can be seen atop the Gradistas hill. One of the original copies of Rigas Fereos’ “Charta” is kept inside the building of the Pashalios School. It is located 42 km NW of Ioannina. Negades. - A traditional village of Zagori (altitude 1,060 m). The triple-naved basilica of Ag. Georgios was founded in 1792. It is located 44.5 km N of Ioannina. Tsepelovo. A traditional Epirus village with a picturesque cobblestone square. Built on a slope of mount Timfi (altitude 1,080 m), it is the ideal starting point for excursions to the surrounding areas. - The church of Aghios Nikolaos (18th century) contains frescos and a gold-plated rood screen. It is located 49 km N of Ioannina. Vradeto. Skala tou Vradeto, a cobblestone trail from the 18th century is the village’s famous landmark. Vradeto is built on a rugged slope (altitude 1,340 m). You can enjoy the wonderful view of the Vikos gorge just 2 km away from the village, at the “Beloi” location. It is located51.5 km NW of Ioannina. Skamneli. A traditional village (altitude 1,160 m), with ruins of Pelasgian walls near the Monastery of Aghia Paraskevi. 10 km away is “Sarakatsaniki Stani”, a replica of a Sarakatsanian settlement which extends on an area of 16 hectares and operates as an exhibition space. It is located 52.5 km N of Ioannina. Vrisohori (altitude 940 m). The village received its name from its numerous springs and plentiful running water. This is the starting point of the trail leading to the peak “Tsouka Rosa” of Timfi at 2,377 m. The age-old sycamore at Iliohori has a diameter of 11m. It is located75.5 km N of Ioannina. Tristeno. Three narrow passages between hills which are traversed by streams gave their name to this beautiful mountain village (altitude 940 m), with its plentiful running waters, springs and stone houses. The watermill from the 19th century operates and mills grains the traditional way. The steeple of the Aghios Georgios church (18th century) hangs from an adjacent strong age-old sycamore. It is located 40 km NE of Ioannina. Greveniti. A mountain village (altitude 980 m) with running waters, near which operates a trout aquaculture. The frescos in the church of Panagia (18th century) where drawn by hagiographers from Kapesovo. 6.5 km NW, near the Vardas river, is the old Monastery of Voutsas or Votsas, which according to rumors was built by the Byzantine emperor Konstantinos IV Pagonatos (7th century). It is located 41.5 km NE of Ioannina. Doliani. A traditional village (altitude 920 m) built on the border between Eastern and Western Zagori, containing houses of typical Epirus architecture and masterly crafted stone bridges. The view from "Kouri", the stone atop the hill with the chapels of Ag. Paraskevi and Ag. Gerogios, is breathtaking. It is located 43 km NE of Ioannina. Vovousa. A traditional village (altitude 1,000 m) traversed by the Aoos river and built in a lush location containing rare animals and plants. The stone arched bridge dates back to 1748. Vovousa is very near the national park of Pindos (Valia Kalda). It is located 71.5 km NE of Ioannina. VIKOS GORGE: A hidden gem of Greece. 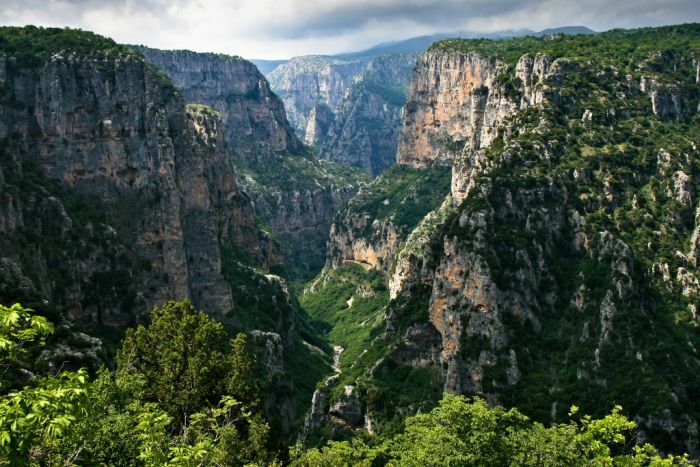 Vikos Gorge holds a Guinness world record for being the deepest gorge in the world. The gorge constitutes a true natural monument. Its overall length exceeds 30km (Tselepovo-Kleidonia). Its depth varies. In Monodendri it reaches 600m and is its the narrowest point and in Vikos village it reaches 1.200m (more than 1.300m in its east part and approximately 1.100m in its west part). In its deeper part the gorge reaches approximately 2.200m width. Due to its geological isolation and the absence of human presence, Vikos gorge includes rare plant and flower species of Epirus. There have also been recorded more than 110 bird species, 19 serpent and amphibian species, as well as many rare butterfly species. Finally, in Aoos and Voidomatis rivers live 7 fish species. The best period to visit the gorge is during summer and in the beginning of fall when the river is shallow. This fact makes passages easier to cross. If you have a stable pace you can cross the gorge in approximately 7 hours. It might sound very long but the scenery with its beauties will definitely reward you. It was designated a National Park in 1973. Its core area consists of the Gorge of Vikos, the length of approximately 10 km. At the lower part of the gorge a rushing river flows, which becomes a permanent river (Voidomatis) at its end. The peripheral area is larger and includes the Aoos Gorge, the area of villages of Mikro Papigo and Megalo Papigo as well as a narrow area around the Gorge of Vikos. The variety of the deciduous trees in the area of the heterogeneous forest is amazing. In the narrow, warm, wet and shady ravines and the steep slopes of the beech tree zone exist formations of Aesculus hippocastanum, Juglans regia and Fraxinus excelsior. The area comprises one of the most significant ecosystems due to its rare flora and fauna. The geographical isolation of the area, the relative small human impact and the large variety of kinds of natural habitats and microclimatic conditions favor the growth of various plant species. Therefore, the area is a place where many rare plants are gathered and sustained. Many of these are considered endangered species. They lie scattered on Greek mountains, enveloped in myth about strange creatures and storiescreated by locals in the past. These blue gems decorate the green and sometimes white backdrop of alpine meadows, enhancing the beauty of Greek mountains. They are to be found on hard-to-reach mountain peaks mostly on the Pindus range, on the mountains of Epirus and W. Macedonia. They provide the perfect setting for relaxing and they are a source of beauty and wellbeing to nature-lovers as well as valuable objects for research to scientists. Their name brings to mind fairytales and their existence is a precious gift of Mother Nature! These mountain lakes are the well-known dragon lakes (drakolimnes) which are remnants of the Ice Age according to scientists, or the dwelling places of dragons incessantly fighting each other according to tradition. They are areas with a singular and sensitive ecological balance. High temperatures, scant nutrients, wide variations in sunlight during the summer and the winter months have turned these alpine lakes into truly unique ecosystems. Their waters are home to the Alpine Newt (Triturus alpestris), a very interesting urodele amphibian, and a strong swimmer which also walks out of water. It is approximately 10-12 cm long with an impressive orange-red colour in the lower part of its body, and a dragon-like appearance!